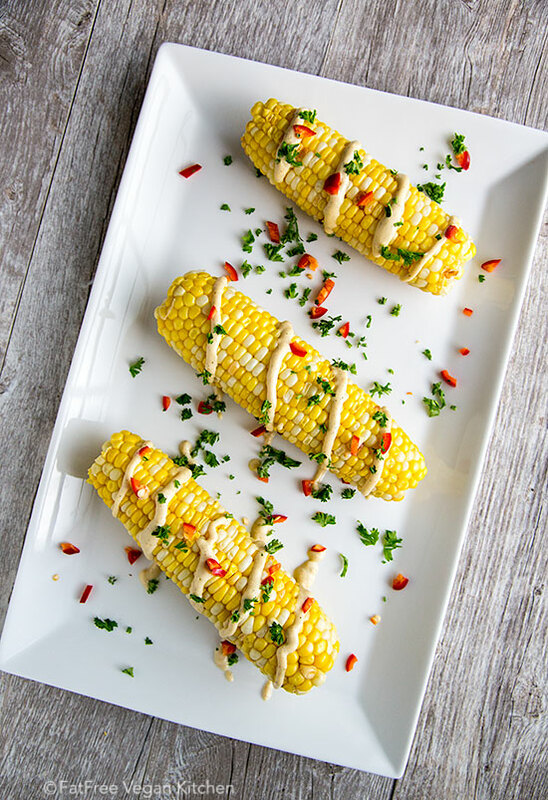 Fresh corn on the cob is slathered in a spicy, limey, cheesy, vegan sauce and sprinkled with chopped jalapeño peppers and cilantro in this vegan elote or Mexican corn recipe. I’m counting down the days (less than three) until my husband D and I drive our daughter to college 796 miles away. Because of the anticipation, the dread, the planning, the shopping, and the packing (or at least the nagging E to pack, without much success), I haven’t been doing a lot of cooking, or at least not original cooking. I’ve relied on old standbys, like burritos made with canned beans, to get us through most days, though in the last week I’ve been honoring E’s requests for some of her favorites. At her going-away party last Friday, I served the sesame-peanut noodle salad she’s always loved (and which is much too high in fat to qualify for this blog). Last week we had Pasta and Vegetables with White Sauce, and last night she requested her very favorite meal, lasagna, garlic bread and salad. And don’t tell her but tonight I’m planning to surprise her with Ribz. 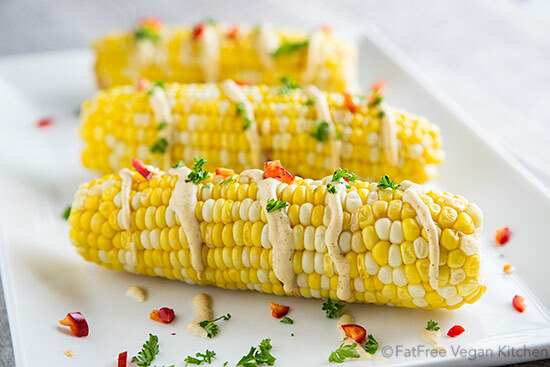 I’ve seen a lot of recipes lately for Mexican Street Corn, which looks beautiful, but since I’ve been vegan since the Dark Ages, I’ve never tasted. Traditional recipes involve mayo and cheese, but I thought it would be delicious to slather corn in a spicy, limey, vaguely cheesy, vegan sauce, so I did a little experimentation until I found a concoction I loved. The best news is you can put this sauce on anything to liven it up, so feel free to drizzle it on your potatoes and veggies or even toss it with some pasta. Anything goes. This spicy, tangy sauce is also delicious on baked potatoes and other vegetables. I like the nutty flavor and Omega 3’s that hemp seeds give it, but if you don’t have them, pine nuts are a close substitute. Cook the corn in any way you want. Grilled tastes best, but I save time by using my Instant Pot or pressure cooker. Just put a rack or steaming basket in the pot, place the shucked corn on the rack, and add about 1 1/2 cups water–enough to cover the bottom by a good 1/2 inch but not rise above the bottom of the rack. Cook at high pressure for 4 minutes. Quick-release pressure manually. While the corn is cooking, make the sauce. Combine “milk” and all remaining ingredients EXCEPT lime juice and garnishes in a blender and blend until smooth. Pour into a saucepan and cook over medium-high heat, stirring constantly, until it boils and thickens. Add the lime juice and continue to cook for another minute. If the sauce is too thick to drizzle or pour, add more non-dairy milk by the tablespoon to thin it out. Taste and add extra salt, cayenne, and lime juice, if you like, and remove from heat. 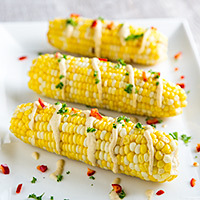 Serve the corn drizzled with the hot sauce and sprinkled with your choice of garnishes. One serving of the sauce is 2 Weight Watchers Freestyle points. After we drop E off at college, D and I are going to try to stave off empty-nest depression by taking our first vacation alone in 18 years. I’ll be posting photos on my Instagram account of the animals and pretty scenery of South Dakota as well as some of the vegan food we sample (a trip to a famous vegan cookbook author’s restaurant just might happen!) So please follow me there if you want to see what we’re up to. Great idea for Summer evenings! I hope your vacation will be lovely, no need to be sad…be happy, kick empty nest feeling out of the window =). Take Care! Voted. I don’t cook much, but you are my go to recipe site. Thank you! I’ve both benefited and enjoyed your blog & recipes, so this is the least I can do; you continue to inspire this lackadaisical vegan wanna-be. This is really good!!! I appreciate a new use for hemp seeds too!! We are having a cookout- Go West Young Man send off for him and I will whip some of this up for the corn we are serving that day. Best of luck to E! Will E follow a vegan food plan while in college? Is she a vegan? Yes, E was born and raised a vegan and will continue to be vegan in college. She chose a school with great vegan options at every meal. Check my Instagram for a photo of the delicious meal we shared a couple days ago. Amazing corn-on-the-cob recipe. Just perfect during barbecues or picnic. Am eating this now, made it for my dinner tonight. So good! It taste like I’m eating a really good piece of buttered corn! I used powdered lime which gave it an even more intense lime flavor. I’m thinking you could use this to dress brown rice or a pasta salad. Hey there! The corn looks great! – how long would this sauce last do you think in the fridge? I haven’t made it yet hence no stars checked yet. Thanks for the info! I would use it within a week. Hope you enjoy it!